Anecdotal evidence suggests that corporate borrowers may be due for a reckoning. 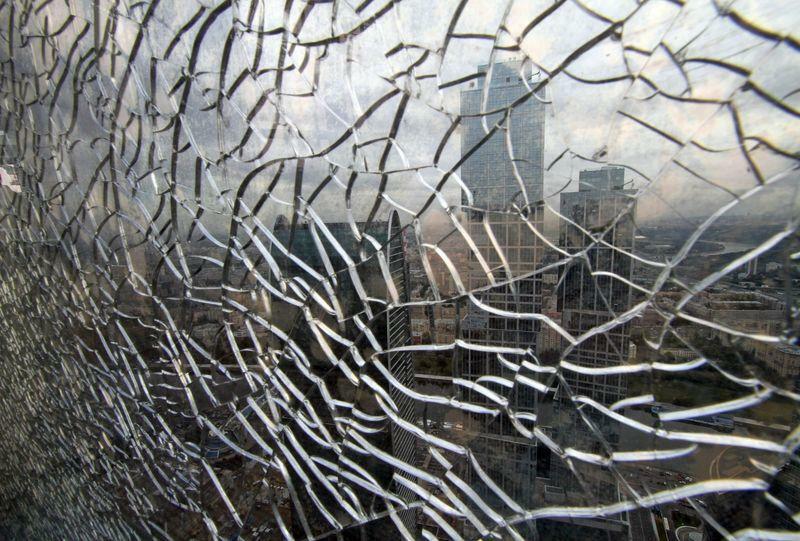 A growing spider web of evidence suggests a credit reckoning may be near. For years, the naysayers have been warning about the precariousness of the corporate credit market. In an environment where balance sheets have become more and more bloated from excess borrowing stoked by the Federal Reserve’s easy-money policies, shrinking bond yield premiums don’t make sense. At some point, they argue, there will have to be a reckoning. Could we be nearing that point? On the surface, it’s hard not to like corporate bonds, despite yields being at some of their lowest levels relative to U.S. Treasuries since before the financial crisis. After all, corporate earnings are booming, thanks to an expanding economy and tax cuts, and the default rate is miniscule at less than 3 percent. On top of that, the number of companies poised for an upgrade at S&P Global Ratings is the highest in a decade. All that said, there’s mounting anecdotal evidence of possible cracks in the credit facade. One place you can see them is in the latest monthly survey put out by the National Association of Credit Management. This organization surveys 1,000 trade credit managers in the manufacturing and service industries across the U.S. Like most surveys of its kind lately, the main index number was down a bit from its recent highs. But some Wall Street strategists are focusing on a more alarming data point showing a collapse in a category called “dollar collections.” The index covering that part of the survey - which measures the ability of creditors to collect the money they are owed from their customers - tumbled to 46.7 in April from 59.6 in March, putting it at its lowest level since early 2009, the height of the financial crisis. The folks at the NACM aren’t quite sure what to make of the big plunge, which could turn out to be an anomaly. What they do know, however, is that credit conditions are getting weaker. As they describe it, the strengthening economy has forced more companies to boost borrowings to keep pace with their competitors. Now, they may be struggling to keep on top of that debt. 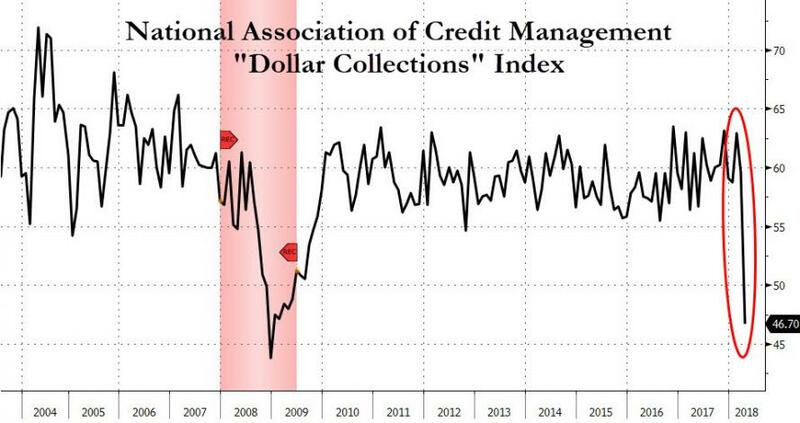 “It looks like creditors are having more challenges as far as staying current, which may be contributing to the very weak dollar collection numbers,” NACM economist Chris Kuehl wrote in a report accompanying the monthly survey results. There may be something to that. The Institute of International Finance noted in a report last month that U.S. non-financial corporate debt rose to $14.5 trillion in 2017, an increase of $810 billion from 2016 and a figure that equates to 72 percent of the country’s gross domestic product (a post-crisis high). About 60 percent of the rise in debt stemmed from new bank loan creation, which is worrisome since those borrowings roll over more frequently than bonds and are tied to short-term interest rates, which are rising at a much faster clip than long-term rates. As an example, the three-month London Interbank Offered Rate for dollars has jumped to 2.35 percent from 1 percent at the start of 2017. While that’s still low historically, any small increase gets magnified across such a big amount of borrowings. “Rising interest rates will add pressure on corporates with large refinancing needs,” the Washington-based Institute of International Finance wrote in its report. It estimates about $3.8 trillion of loan repayments will be coming due annually. Credit is the lifeblood of the economy and financial markets. As such, it has a reputation for being a sort of early-warning system for investors and leading indicator for riskier assets such as equities. The equity strategists at Bloomberg Intelligence say they are noticing that stock performance is starting to correlate strongly with corporate balance sheet health as well as profitability. In an April report, they wrote that over the prior year, stocks of Standard & Poor’s 500 Index members with higher cash ratios outperformed low-ratio counterparts. Also, stocks of companies with higher net-debt ratios relative to both cash flow and market capitalization underperformed lower-debt counterparts, with average monthly return differentials of 1.1 percentage points. A growing number of influential Wall Street firms, from Guggenheim Partners to Pacific Investment Management Co., and from BlackRock Inc. to Greg Lippmann - who helped design the “Big Short” trade against subprime mortgages - are raising the alarm about the dangers growing in credit markets. It may well be that the reckoning is closer than we think.